Today is Remembrance Sunday, the closest Sunday to 11 November (Armistice Day), marking the anniversary of the end of the First World War in 1918. Remembrance Sunday is held to commemorate those who served the country in two world wars and in more recent conflicts. There will be the traditional two-minute silence at the Cenotaph on Whitehall at 11am today. I think I should know more about the two world wars. There are many books and I’ve read some, mostly novels about the Second World War, but I haven’t read any military histories that go into the detail of the battles and the conditions the forces experienced. So when Victoria Richman emailed and asked me whether I would like to read Highlanders’ Revenge, a book that combines historical fiction and military history I accepted her offer. She is the co-author with her uncle, Paul Richman, writing under the pen name of ‘Paul Tors’. Paul is a retired business man with a passion for military history and Victoria, also known as Tors, is a Creative Writing graduate who worked on a number of magazines before becoming a freelance writer. Highlanders’ Revenge combines a riotous story of battle and life during World War Two with an insight into the world of a little known, but fierce fighting unit; the 5th Camerons. This fast-paced historical novel will appeal to fans of military fiction who also appreciate historical accuracy. Highlanders’ Revenge tells the story of Mash, the nickname Highland soldiers give to an Englishman in their ranks. Scarred both from the retreat before the Blitzkrieg advance across France and from the murder of his first love, Mash has to integrate himself into a new section that is wary of the sullen and secretive ‘˜Mash Man’. Together they journey to Egypt where they encounter a way of life that tests them to their limits as they prepare for one of the greatest battles of the Second World War; El Alamein. Scorched by day, frozen by night and plagued by insects, they have to learn how to live and fight in the desert as they prepare for one of the greatest battles of the Second World War. They are then cast into the thick of the fighting at El Alamein and the Allies’ tumultuous battle to break through the Axis defenses. 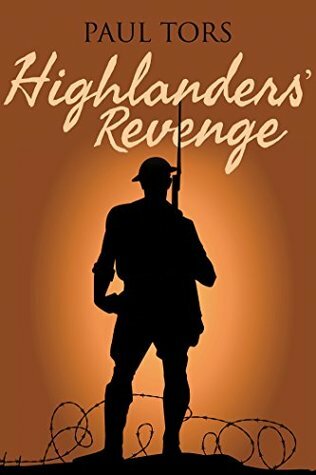 Highlanders’ Revenge is a meticulously researched and very detailed historical novel, about ‘Mash’, an Englishman in a Highland regiment, first as he fought with the 4th Camerons at St Valery in June 1940 during the Battle of France and then in the 5th Camerons at the second Battle of El Alamein between 23 October and 4 November 1942. This novel vividly portrays the horror of war. I think it combines historical fiction and military history well and there is an extensive glossary at the end of the book that explains a lot of the terms that I hadn’t come across before. I learnt a great deal about World War Two, particularly about the second Battle of El Alamein. It brought home to me the devastating conditions that the troops encountered, not just the reality of war but the physical presence of the heat, the multitude of insects, the dust and the sand, and the almost constant dysentery. There is an excellent Author’s Note explaining where the novel diverges from the historical record. The central characters are fictional, but the book is based on real events. There are also maps, a bibliography and as I mentioned an extensive glossary. Highlanders’ Revenge is the first step in a journey that will take Mash through North Africa and the invasion of Sicily, onto the D-Day landings, the battles around Caen before the liberation of the Low Countries, the Battle of the Bulge and the crossing of the Rhine before ending the war in Bremen. My thanks to the authors for a digital copy, via NetGalley. Thanks for sharing this, Margaret. The novel does sound like a perfect blend of history and the story itself. And I think the better we understand the wars, the more hope we have of avoiding another cataclysm.